8 flash modes, combination, in waves, sequential, slogs, chasing/flash, slow fade, twinkle/flash, and steady on. 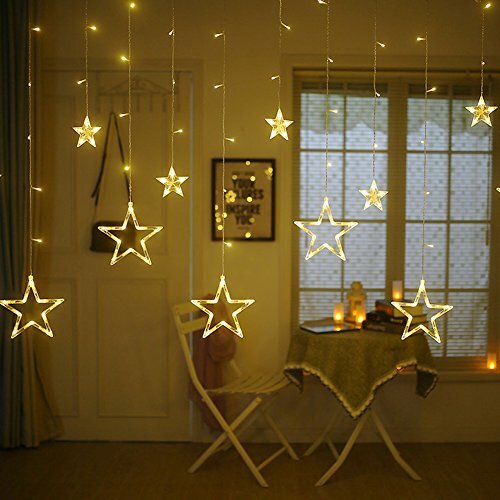 Star curtain lights with 12 Stars 138 LEDs, romantic atmosphere. Safe, power-saving and eco-friendly. High-brightness string light, but not dazzling. Easy to use, just plug in and unplug it for power on and off, simple and easy to set up. Widely used, can be hung on walls, windows, doors, floors, ceilings, grasses, Christmas trees etc. * This product is not a toy, please keep away from children under 3 years old. * Waterproof level is IP44, but the power and controller is non-waterproof, please keep them away from water. * 100% satisfaction guaranteed! If the star curtain lights are not light, please feel free to contact us. 8 mode settings: combination, in waves, sequential, slo glo, chasing/flash, slow fade, twinkle/flash and steady on. 6.7ft×3.3ft star curtain string lights with 138 LEDs, 12 stars ornaments (6 big and 6 small), the large star ornaments diameter is 0.67ft, which each string droops 3.3ft; small star diameter is 0.3ft, which each string droops 2ft. Power line length is 5ft. Easy to use, directly plug in and unplug it for power on and off. UL Certificated Output and wire: 29V Voltage Safe Curtain Lights with UL certified, leads to 29V safe output by UL plug-in transformer. Safe, power-saving and eco-friendly. High-brightness string light, but not dazzling. Waterproof level is IP44, but the power and controller is non-waterproof, please keep them away from water. Star curtain lights, romantic atmosphere. Perfect for indoor and outdoor decorations. Christmas, Valentine's Day, party, wedding, home, festival, holiday, restaurant, hotel, commercial building, shopping center etc. Special offers and product promotions: Receive 1 Three Color Mosaic Solar Lights free when you purchase 1 or more Qualifying items, please remember to Click Add Both to Cart button first then enter code JKIR48BY . Flameless Candles with Remote and Timer - Tealight Candles - LED Tea Lights with Remote - Unscented Outdoor Flickering Candles - Battery Operated Candles 200 Hours - 6 set x 1.8"